Welcome to the online version of WhiteSmoke Writing Assistant, a text-checking application specifically designed for dyslexia and other writing difficulties. If you have dyslexia or another writing difficulty, you know how hard it can be to write an email, letter, or essay without errors. 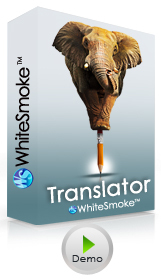 WhiteSmoke Writing Assistant is the ultimate tool for you. It helps all struggling writers to produce readable and error-free texts at home and at the workplace. Follow these instructions for optimal results from WhiteSmoke Writing Assistant. After the text has been analyzed, incorrectly spelled words will be marked in red, and correctly spelled words used in the wrong context will be marked in blue. Right-click on any blue or red word for a menu of possible replacements. If no suggested words seem relevant for your text, select the "No suggestions are relevant" option. Repeat the process until you receive the " spelling corrections have been made" message. You can then copy/paste your text into another application. We have detected you are browsing on Safari. The online Writing Assistant does not currently support Safari. Please try to visit using Firefox (for Mac users) or Firefox/Chrome/Internet Explorer (for PC users) in order to use the online Writing Assistant. This online version of WhiteSmoke Writing Assistant is just a preview - we will shortly be launching a full scale desktop application with additional features such as text-to-speech, automatic transfer of text from your favorite applications into Writing Assistant, and unlimited character count. Fill in the form below to be notified of the WhiteSmoke Writing Assistant release, and receive a 10% discount on the price. Instant results for 10 languages. Translation for over 1 million words. Welcome To The WhiteSmoke Demo!